Singles in New York have a new way to date, network, recharge, and bee social in the big city. Bumble, the popular female-focused dating app, has opened its first physical location in Manhattan’s Soho neighborhood. The pop-up installation has been dubbed ‘The Hive’ and is set to remain open for the month of June. 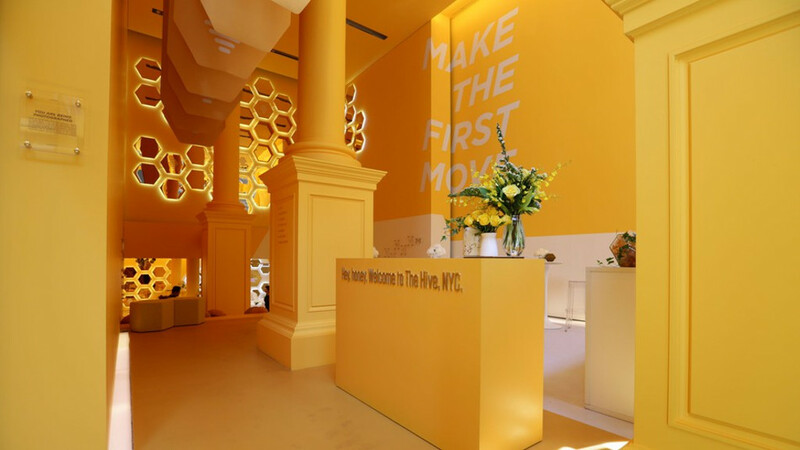 The space is decked out from head-to-toe in Bumble’s branding, featuring yellow walls, honeycomb shapes, and plenty of bee-related puns. The Hive is open to anyone who wants to stop by - users and non-users alike - whether they’re looking for a date spot, a place to hang with friends, a co-working space, or just a respite from the constant buzz of city life. The Hive features a coffee bar and a real bar for visitors who need a pick-me-up. There’s Bumble merchandise on sale, with all proceeds from purchases earmarked for charity. Drybar will be on hand for styling sessions. The physical location is an attempt by Bumble to encourage a sense of community, both on the app and in real life. It’s also an opportunity for the brand to reach beyond dating. The space is a meeting place for anyone, including users of BumbleBIZZ, the company’s foray into professional and social networking. All are welcome in The Hive. The Hive is located at 158 Mercer Street. Opening hours are Thursday – Friday 8am-2pm and 4pm-10pm, Saturdays from 10am-2pm and 4pm-10pm, and all day Sunday from 10am-8pm. RSVPs are currently open online on Bumble’s Eventbrite page.